Sanjay Dutt’s biopic, Sanju is having a golden run at the box office. Sanju buzz is all over and Ranbir Kapoor is getting rave reviews for his performance. Raj Kumar Hirani helmed movie also has Vicky Kaushal in a pivotal role, who played Sanjay Dutt’s best friend Kamli in the flick. Since the release of the movie, the mystery behind Dutt’s best friend has increased. Now, putting an end to all speculations, Bollywood actor R Madhavan took the responsibility to calm down the excitement of all Dutt and Sanju fans by introducing ‘Kamli’ Paresh Ghelani to the world. 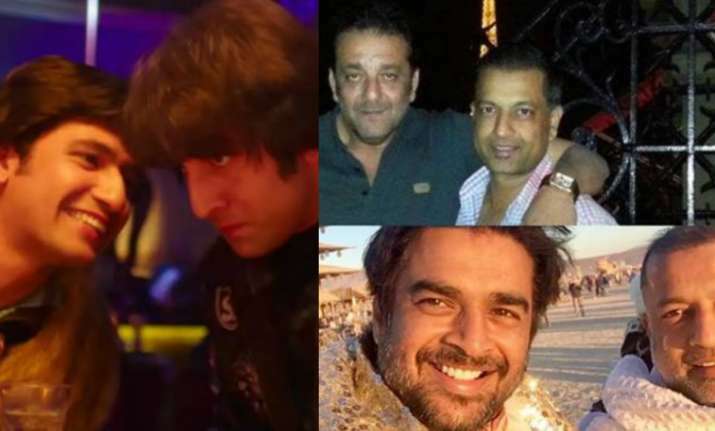 Addressing him as an inspiration and idol, Madhavan shared a collage and wrote, ”FINALLY U R here Bro-Hey Folks pls welcome some1 who is more than a Blood Brother 2 me-my inspiration and my IDOL-THE REAL “KAMILII” from “SANJU”-the elusive,Limelight loathing N my “ Go 2” man 4 all issues-PARESH [email protected] .Sorry bro-The world wants 2 know you”. Shilpa Shetty commented on the post and welcomed Ghelani. ”Welcome welcome @impareshghelani urf Kamli,” she wrote followed by emojis. According to several reports, Dutt and Ghelani are extremely close and have been beside each other through thick and thick. Paresh moved to America quite early in his life and is settled in Los Angeles now. He is an entrepreneur and has been part of companies like Moon Express, Xprize and Radimmune. Both Sanju and Paresh met in New York in their early teens and since then, the duo has been into each other’s life. Hirani’s film celebrates Dutt and Ghelani’s friendship in a beautiful manner. The bromance between Ranbir and Vicky forms an important portion of the storyline. Vicky Kaushal is garnering a lot of appreciation for his subtle acting skills in Sanju.